The validation process for CareConnect, UCLA's electronic health record program, isn't over yet. 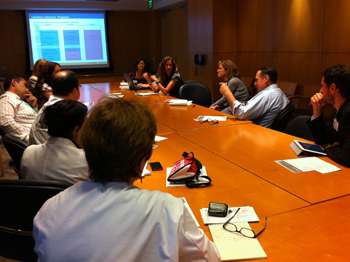 Dozens of faculty and staff members from UCLA Health System and David Geffen School of Medicine are just beginning the process of evaluating oncology-specific workflows in CareConnect in a new round of validation sessions. Round one of Oncology Validation Sessions will be held Oct. 18 - 20 to evaluate workflows in the Beacon application as provided by Epic Systems Corp.'s Model System. The workflows will be evaluated and modified over the three-day period. The outcomes of these and future sessions will serve as the foundation for Beacon's application build. 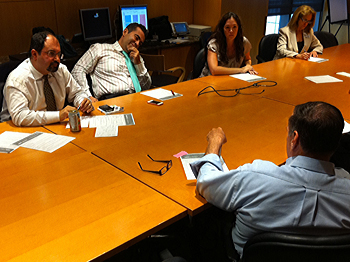 Not long before, CareConnect's Oncology Work Group held its first meeting. The goal is to ensure a successful implementation of Beacon applications at oncology clinics and inpatient units throughout UCLA Health System. 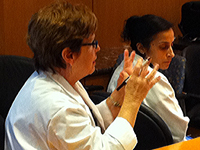 The group was formed to identify and evaluate oncology workflows, clinical content, and key standardization opportunities; review and design chemotherapy protocols, flow sheets, and clinician documentation; and serve as the escalation point for key integration issues, in preparation for Epic's Beacon application implementation. It discussed plans for future meetings, upcoming validation sessions, schedules, and department representation throughout the validation process. "It's great to see everyone so engaged in the workgroup process," said Judith Kanschat, application manager of CareConnect's Beacon Oncology Team. "This kind of dedication by faculty and staff will be key to the successful implementation of CareConnect." Progress in the oncology validation sessions will be tracked on stoplight evaluation forms. Items marked as green represent workflows that can function based on the model system. Items marked as red may be brought back for further review in another round of validation sessions, or escalated to the Oncology Work Group. Additional work groups may be formed to tackle specific issues if needed. 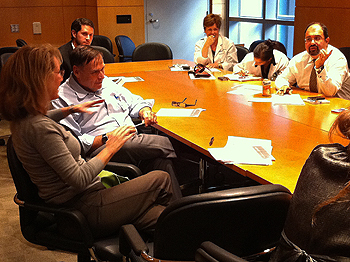 If you are interested in more information about the Oncology Work Group or attending Oncology Validation Sessions, contact Judy Kanschat, application manager of CareConnect's Beacon Oncology Team at JKanschat@mednet.ucla.edu or by calling (310) 267-5498. Click here to see the Oncology Validation schedule. To read more about the validation process, click here for "Faculty, staff work together to examine CareConnect workflows." 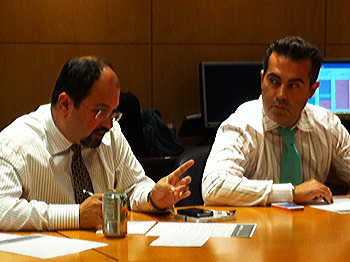 The work group meets for the first time Sept. 23.
chairperson Arash Naeim, MD, (far right). question about workflows at an Oncology Work Group meeting.